Kaitlyn Reed and Steven Braden have always had a similar philosophy of life: when the going gets tough, they get going--out of town and away from the problem. 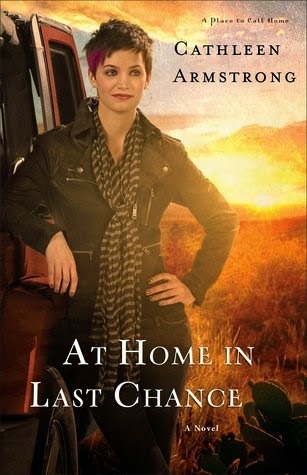 Now they are both back in Last Chance, New Mexico, and trying to start over. Kaitlyn is working to reestablish a relationship with the seven-year-old daughter she left behind six months earlier. Steven is trying to prove to his family that he is not the irresponsible charmer they have always known him to be. As Kaitlyn and Steven find themselves drawn to one another, one big question keeps getting in the way: How will they learn to trust each other when they don't even trust themselves? With emotional depth and characters who leap off the page and into the reader's psyche, Cathleen Armstrong continues to delight her readers and win new fans. Readers will be thrilled to return once more to the small town they've grown to love. Whew...for fiction, this book had a lot of emotional depth. From little Olivia to her mom and everyone that surrounded them, this book will have you feeling all the feels, as the kids these days say..or did the other day, anyway. I did have one teensy problem with this book, though. It was book 3 in a series that I hadn't read and while for the most part, it is a stand alone book, there was more than once that I felt as if I was missing some nuance or bit of information that I would have known from reading the other books. Other than that, it was all good and it made me wonder if tiny places like Last Chance still exist somewhere out there in the west.